This is post #20 in an ongoing series of articles about my work as a poker bot developer. In a previous post, I described how I was banned from PokerStars. Basically I think I was playing the bot too much, PokerStars security got suspicious, reviewed my account, and figured out it was a bot. I actually built the bot to run on both PokerStars and FullTiltPoker (FTP), but due to problems interfacing with FTP’s software, I abandoned it and focused on PokerStars. I have a bit of an odd question. I have an account with FullTiltPoker under the name “…” that I used for a few weeks in early 2008 to test a poker bot I was developing. The bot played about 300 low stakes Heads Up SNG’s but mostly due to the difficulty of building a bot for the FTP software, I turned my efforts to PokerStars and continued my work there. My account at PokerStars (“kaon”) lasted until early October 2008 when it was promptly suspended for operating the bot. I have not attempted to run the bot since that time on PokerStars, FullTilt, or any other network for that matter. In the interest of full disclosure, I have written about my work on my programming blog (see: http://www.mattmazur.com/category/poker-bot/). I may be intersted in playing poker again at some point in the future and I’d like to do it on FullTiltPoker if possible. For what it’s worth, I have no intention of ever running the bot again–indeed, I wish I had never tried to make it in the first place. Why tell you all this? I’m afraid I might build up a significant bankroll and then somehow your security team will learn of my former bot transgressions and suspend my account. If I never violate Full Tilt’s Terms of Service again, can I play on your service without fear of having my account suspended? Regardless of your decision, thank you for the excellent support. Thank you for your mail and for your candor. Full Tilt Poker retains authority over the issuing, maintenance, and closing of players’ accounts at Full Tilt Poker. The decision of Full Tilt Poker management, as regards any aspect of a player’s account, use of the Software, or dispute resolution is final. You are not permitted to set up any more accounts with Full Tilt Poker. Should you do so, any further accounts will be closed and their balances may be forfeited. I kind of smacked myself in the head after this. Why, oh why, did I email them in the first place? I had no intention of playing poker at that time and there was no indication that they were investigating me (though they could have looked up my account by my name), so what value did emailing them have? After a bit of introspection, I realized the answer: I wanted to burn the bridge. Having an active FTP account was good because it enabled me to turn back to poker should I ever need extra money. But getting banned from FTP, the largest poker site next to PokerStars, was great because it forced me to abandon poker as a possibility. Sure, I could probably grind it away on some of the less popular sites, but PokerStars and FTP are where all the money is. With poker not a viable option, I had to focus on my startup pursuits because I had no fallback plan. What’s your backup plan? Would eliminating it give you a better chance at succeeding at your current endeavor? What are you working on? How can I help? My nights and weekends pursuits over the past five years can be divided into two overarching categories: poker and startups. In both cases, I’ve received a ton of help from individuals as well as online communities including Two Plus Two and HackerNews. I wouldn’t be where I am today without the help of many people along the way. In an effort to pay it forward, maybe I can be of some help to you. I’m not an expert by any means, but I’ve spent a fair amount of time playing poker and working on a poker bot (~3 years) as well as working on various startup endeavors (~2.5 years) and I’ve learned a lot along the way. If you’re working on a poker bot or a startup and need an outside perspective to bounce your ideas off of, review what you’ve done, or anything else drop me a note: matthew.h.mazur@gmail.com. I Eliminated the Free Plan from my Web App for a Month: Here’s What Happened. 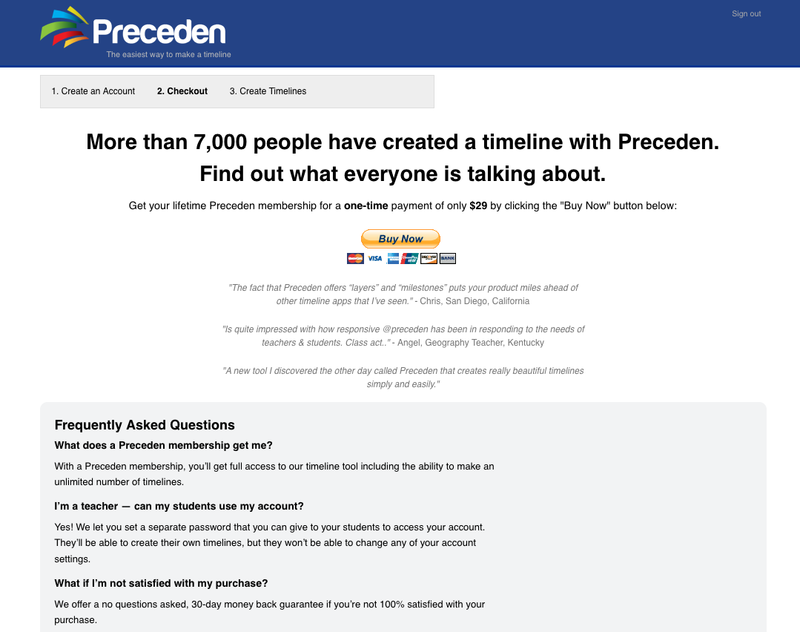 In January 2010 I launched Preceden, a free web-based timeline tool. In May I migrated to a freemium plan, where users could add a certain number of events for free but had to upgrade to the pro plan in order to create more than that. After some experimentation with different limits and prices, I settled on 5 events for free and a one time payment of $30 to upgrade to the pro plan. Looking over the revenue figures I wondered: What would happen if I completely removed the free plan? Instead of a user being able to create 5 events for free, new users would have to pay first to use it. After about three minutes of planning, I decided to go ahead and implement the change. I wanted to change as little as possible so that the results of the experiment would be accurate. After all, you can’t change several variables at once and then attribute the changes to only one. That being said, I made a few small changes to the site which may have affected the results. I shouldn’t have made these changes, but at the time I was more focused on the potential increase in revenue than on running a proper experiment. Notice at the top of the new sign up page it indicates what step of the process you are on (1. Create an Account, 2. Checkout, 3. Create Timelines). I also changed the copy on the button from “Create my Account” to “Create Account and Proceed to Checkout”. The wording will come into play later. The number of homepage and sign up page visitors was taken from Google Analytics by looking a the number of new visitors to those particular pages. Promotions refers to users I upgraded because they are bloggers and bloggers can get upgraded to the pro account for free. From Nov 1 – Dec 4, 3287 new visitors came to the Preceden homepage, 894 visited the sign up page, 567 created an account, and 22 upgraded to a paid account. That’s a 0.67% conversion rate from new visitor to paid user. From Dec 6 – Jan 1, 3343 new visitors came to the site, 528 visited the sign up page, 210 created an account (oops), and 5 upgraded to a paid account. That’s a 0.15% conversion rate. Users who were able to test Preceden before paying were 347% more likely to upgrade to a paid account than those who weren’t. Also — and this is definitely my fault — 205 people filled out the sign up page and then abandoned the process on the Checkout page. Why? Most people probably didn’t realize they had to pay before using it. Sure, the Pricing page said “$29 for Unlimted Access” without mentioning a free account and Step #2 of the sign up process was called “Checkout”, but overall the copy didn’t clearly indicate that you had to pay before you could use the app. Another problem is that the site doesn’t include a demo. It includes examples, but nothing the user can create on their own. Adding a demo section so that new users can get that “Oh cool” moment would have gone a long way. The good news is that about 4% of the people who created an account converted to the paid plan when they were able to test the product first. Even if the pay-first experiment resulted in better figures, I feel more comfortable letting users test the product before paying. I think this depends a lot on your app and your business model, but for a tool like Preceden there’s no reason not to let people try it for free first. Accordingly, I’m switching back to the freemium version starting today. If you run a web app and start building a new product, don’t neglect what you’ve already built. Dedicate some time each week to analyzing your key performance indicators and to making small changes — they’ll add up in the long run. The best way to test this would have been to run the experiment on a fraction of visitors to the site. For example, show a pay-only version to half of the visitors and a free plan version to the other half. Don’t change several variables at once when you run an experiment. Every change you make will affect the results. The time of the year matters. Measuring only the number of paid users would be a bad way choice because a lot of the customers are teachers and I don’t imagine a lot are on the market for a new teaching tool in December. Measuring the conversion rates is better, but there still may be a “Oh I’ll wait till after the holidays to pursue this” mentality among some of the visitors, which could have affected the results. Running this experiment simultaneously would have yielded better results. Over the next few weeks I’m going to experiment with A/B testing and AdWords to see what’s possible. I’m also going to email the 205 people who signed up during this experiment but didn’t pay; I’m sure they’d be interested in trying it out. Can you think of anything else that might improve the conversion rates? Leave a comment below and I may test it out. If you enjoyed this post, you should subscribe to the RSS feed for this blog to get future updates. Also, if you’re a web designer or developer I’d love to get your thoughts on jMockups, my new web design startup. Drop me a note at matthew.h.mazur@gmail.com or @jmockups on Twitter. Thanks!